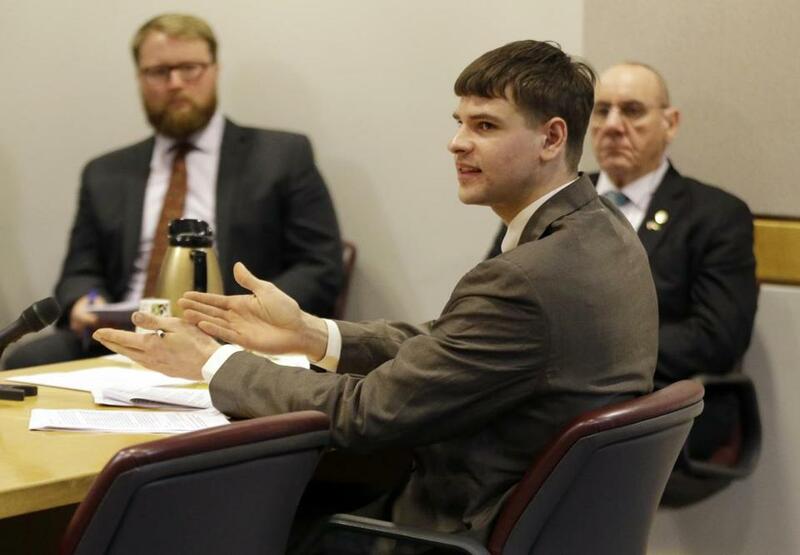 Nathan Carman in court earlier this month. The assertion was contained in a court filing that Carman’s attorneys submitted Friday in US District Court in Rhode Island. The insurer for Carman’s boat, which sank with him and his mother on board in September 2016, is suing him in Rhode Island in an effort to have his insurance claim on the vessel denied. The developer John Chakalos, Carman’s grandfather, was found shot to death on Dec. 20, 2013, inside Chakalos’s Windsor, Conn., home. Carman had dinner with him the night before and was the last person known to see him alive, according to a police affidavit. Authorities have alleged that Carman purchased a Sig Sauer 716 Patrol .308 semi-automatic assault rifle, the same caliber weapon used to murder his grandfather, and that Carman’s firearm and the GPS in his motor vehicle went missing after the slaying. Carman has denied shooting his grandfather and hasn’t been charged criminally in connection with the case, though Connecticut investigators have labeled him a person of interest. In September 2016, Carman and his mother, Linda, set sail from Point Judith, R.I., for a fishing trip on his 31-foot aluminum boat, which sank during the trip. He was rescued a week later, but his mother hasn’t been found. Carman has also denied killing his mother and hasn’t been charged with any crimes related to her disappearance. He’s being sued in a separate lawsuit by his aunts in New Hampshire, who are trying to block him from collecting his mother’s share of the $44 million estate that Chakalos left behind when he was killed. With Linda Carman missing and presumed dead, her share of the estate would eventually go to Nathan, her only child.